There is nothing complicated about hunting waterfowl in the Netherlands of Manitoba. Ducks and geese are just about everywhere. 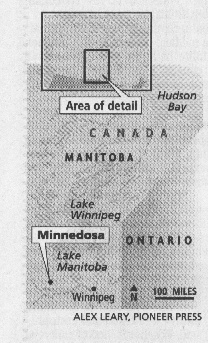 Minnedosa, Manitoba – In the gathering twilight, flocks of mallards, wigeons and teal tumbled out of the sky into a quilt-work of potholes interspersed among wheat fields and canola fields. The ducks swoop in unwarily, wings cupped. You could throw out decoys if you were so inclined, but it’s not necessary. There is nothing complicated about hunting waterfowl in the Netherlands of Manitoba — ducks and geese are part of the landscape like dirt roads and wheat combines. They’re just there. Waterfowl are, in fact, just about everywhere. People aren’t. To get permission to hunt on this pothole, Scott Scherer of Minnetonka and I had to drive 15 miles into a small town and asked around to see who owned the slough. The owner, we learned, owned the local Chinese restaurant. He wasn’t in the kitchen, but his wife was, hunkered over the grill. Farmers in the dining room sipped coffee and chewed on the lunch special -— chow mein. Then she disappeared into the kitchen. The slough was a series of ponds separated by a dirt road and surrounded by willows. We split up. Scherer and I hunted one side. Jim Marshall of Fairfax, Minn., and Robbie Faught of Woodbridge, Va., were on the other side of the road. Ducks coursed between the ponds- Gadwalls. Wigeons. Blue-winged teal. When the afternoon waned, flocks of mallards flew in from the wheat fields where they fed all day. 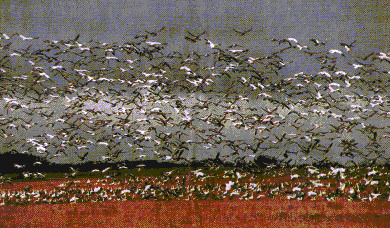 A few miles away, a flock of snow geese a half- mile long swarmed over a recently cut canola field. Canada geese fed in a wheat field not far from the snows. We had watched all of them with binoculars. Waterfowl were everywhere. With a few hours left in the day, we gathered at the edge of the slough. 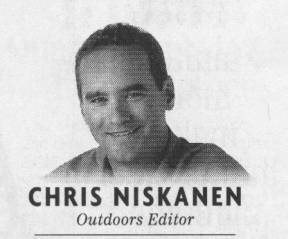 Faught shook his head and said he rarely had seen such waterfowl shooting in his life, especially on the East Coast. 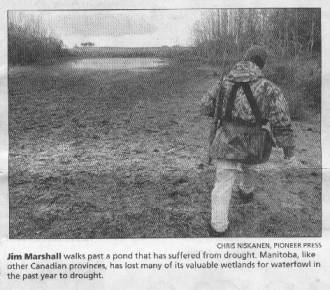 We were just a few birds short of a limit (in Manitoba, the duck limit is eight birds per person daily, two more than in the United States), so Scherer sat on a different pond and waited for the evening flight. As we watched ducks on the horizon, a pair of coyotes howled to each other from across the ponds. It was quiet enough to hear a car door slam a half-mile away. But of course, there was no one about at this time of the day; the farmers were done combining, the narrow dirt roads quiet of traffic, the countryside empty of people except a few duck hunters. Desolation, too. When it came time to pack up for the day, Scherer’s truck became stuck — and so were we for two hours. While northern lights flickered overhead, not a single vehicle passed us. Coyotes were the most plentiful night time travelers.